High speed flat surface cleaners can consist of 2 or 3 (dual or tri arm) arms that spin in a counter clock wise direction for up to 1800 RPM (rotations per minute). At the end of each arm you will find a 1/4” MEG 25° spray nozzle that can cover the path from 16” to 30” diameter, depending on the size of the actual round housing. These cleaners can remove dirt for up to 15 times faster then the standard wands and 10 times faster than the water brooms. Operation: the user walks behind the unit holding the two handles from which one of them has a spray gun that works the same like any other pressure washer gun. The arms are connected to the shaft that is part of the spinning head (a mechanism that allows smooth rotation of the arm). These arms rotate/spin with the flow of the water (greater the water volume – the faster the spinning times), which creates a scrubbing action with the water coming out. 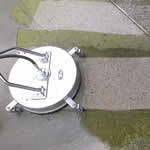 The spray nozzles are only 1/2” to 2” away from the surface which allows greater cleaning capabilities. The edge of the housing and the brush skirt protect the surrounding area from over spraying. Some of our models come with the casters and some without. Units without the casters are designed to “hover” or “float” above the ground, so the maneuverability is not an issue. The greatest advantage of these machines is that they eliminate the “zebra” stripping usually found on driveways and sidewalks. 1) Connect to Pressure Washer. 2) Turn water on and open valve. Open trigger gun for flow of water through nozzles. Nozzles must have flowing spray. If not, remove tips and clean; reassemble, making sure that groove of nozzle is parallel to spray bar. Use Teflon tape when installing nozzles. 3) Start Pressure Washer. The flat surface cleaner is ready for operation. 4) Walk slowly behind the flat surface cleaner, cleaning as you go. If striping occurs, slow down your pace. 5) Periodically check weep hole on bottom of swivel. Water will seep slowly; if water shoots out, stop and replace seals. Swivel assembly can be rebuilt. 6) For maximum effectiveness keep spray nozzles clean. If the machine vibrates, stop and clean spray tips. 7) Lubricate swivel with one squirt of good quality grease every 200 hours of operation or about once a month if used daily. A small amount of grease coming out of the bottom of the swivel is normal. How much time will this equipment actually save me (versus using the standard wand)? The following comparison shows the time taken to clean a typical size driveway (400 sq. ft.) using 2 different components. Is there any over spray? The brush skirt will eliminate any over spray. Is it easy to move and control? How close does it get to walls? With the surface cleaner, you've got full wall clearance. Does it save water or does it use more? How much? It uses the same amount produced by your pressure washer. You state that it has "enormous energy savings", how so? You just walk behind it, v.s. if you clean with the standard wand you have to swing the wand 200-300 times to clean a typical size driveway. Does it have a lot of maintenance/upkeep? It has a minimum moving parts therefore very few possibilities that something will break down. See other testimonials from our customers about the powerful flat surface cleaners.